Peirce Mill re-opened on October 15, 2011, milling grain for the first time in 18 years. Before the millwheel shaft split apart in 1993, the mill had informed generations of Washingtonians about early American technology and the agrarian past of the Nation’s Capital. 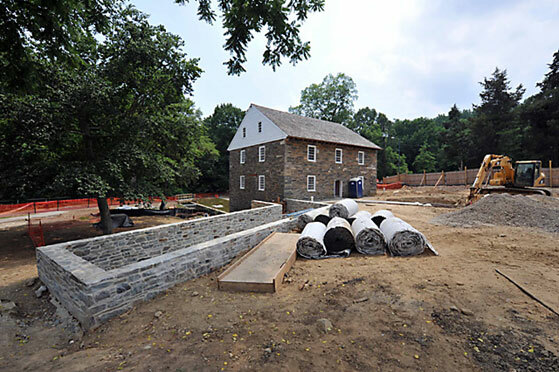 The restoration project represented a new era: for the first time, a public-private partnership took responsibility for repairing—and is now managing—a major destination within Rock Creek Park. The non-profit, volunteer-led Friends of Peirce Mill (FOPM) was formed in 1997 by Richard Abbott, a former docent at the mill, when it became apparent the National Park Service didn’t have the funds to restore the mill. FOPM retained Quinn Evans Architects and Robert Silman Associates (structural engineers) to perform a series of architectural and engineering studies of the structure. 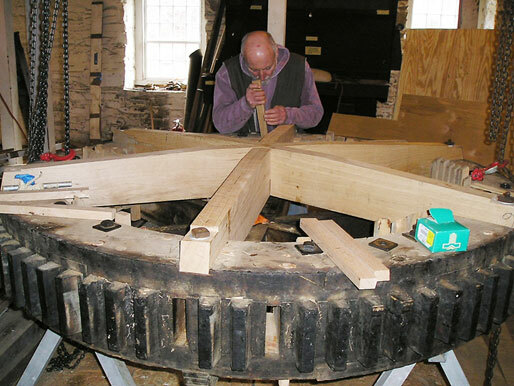 At the same time, FOPM engaged Derek Ogden, a leading millwright and mill restoration expert, to examine the condition of the wooden milling machinery and to recommend repair or replacement of parts required to make it operational. Restoration work began in 2001, when the first repairs were made to the internal structure of the building, including the columns and beams which support the first floor, and selected floor joists. Ensuring the safety and stability of the mill itself was a critical first step before work could begin on the mill’s machinery. Most of this phase was completed by 2004. 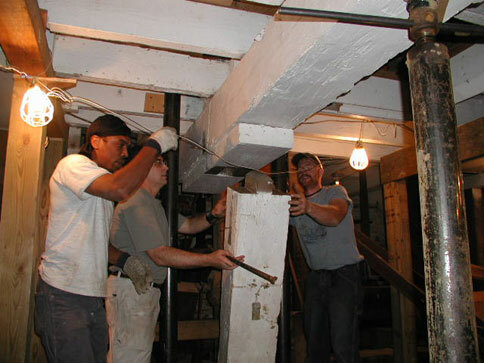 A damaged column is removed in November 2003. Beginning in 2004, work began on repairing and/or replacing elements of the wooden milling machinery, including the hurst frame (on which the main gears and shafts are mounted), water wheel, main shaft, and internal gears and shafts. Work on the mill building continued. The old mill wheel was removed in April 2005. The roof was replaced in early 2007. Millwright John O’Rourke is seen working in 2009 on elements of the “spur gear,” which helps transfer the energy of the water wheel to the millstones. 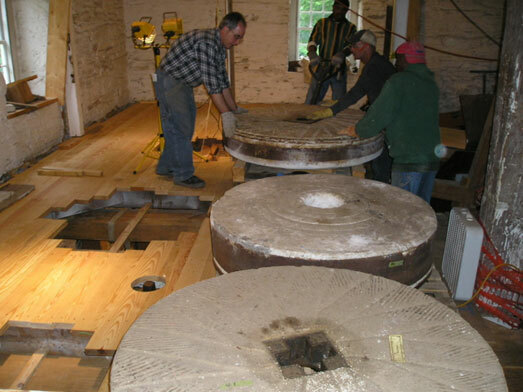 The millstones were moved back into position in September 2010. 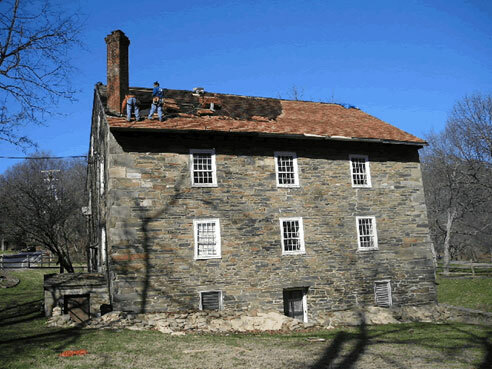 In 2010, the National Park Service received $2 million for the restoration of Peirce Mill as part of the economic stimulus package authorized by the American Recovery and Reinvestment Act (ARRA) of 2009. FOPM raised an additional $1 million through donations and grants, which leveraged the ARRA funds to complete the effort to bring the mill back into operation. 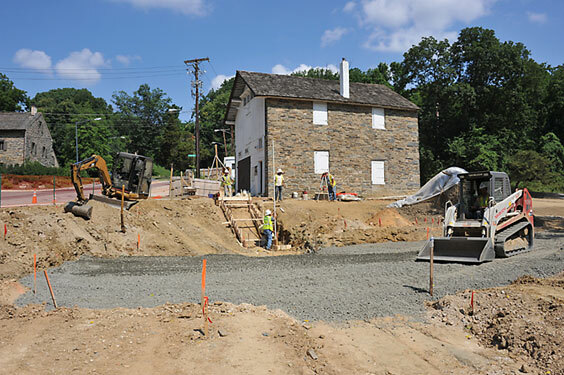 The project included extensive landscaping work around the mill site, including removal of the old asphalt parking lot and comfort station, which made the site more closely resemble its appearance in the 19th century. A bus parking area was built just uphill from the visitor center where school buses can safely offload students visiting the mill. Construction took place from 2010 to 2011. A new headrace was installed as part of the ARRA construction project in early 2011. A tractor levels gravel to recreate the historic millyard between the mill and the carriage house in June 2011. One element of the ARRA project was installation of the mill’s pumped water system, designed by architects retained by FOPM. The system uses city tap water to move the mill wheel and mill stones. The closed system re-circulates the water rather than releasing it into Rock Creek. A stone enclosure that partially follows the historic path of the mill’s headrace was constructed to contain the water pumping system. Stones were laid in the ground to trace the rest of the path of the historic headrace from Rock Creek. 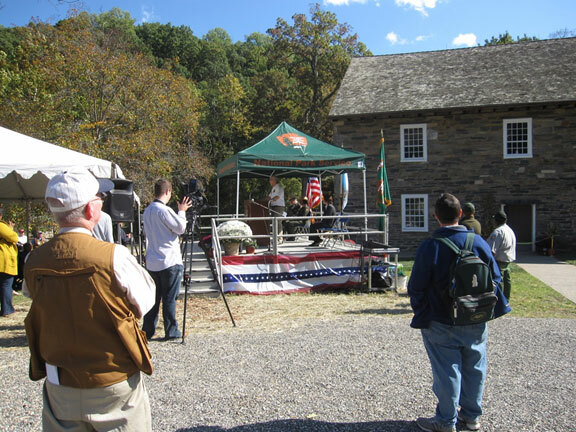 A grand opening for the restored mill was held by the National Park Service and FOPM on October 15, 2011, with Steve Whitesell, Director, National Capital Region in attendance. Corn grinding demonstrations have been held regularly since that time. A stage was set up outside the mill for the grand reopening ceremony in October 2011. 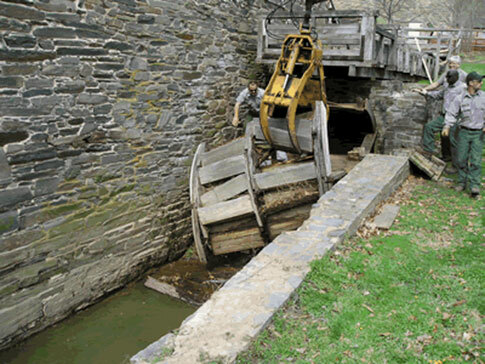 While the waterwheel and millstones are turning again, work to fully restore the mill is not yet finished. FOPM continues to spearhead efforts to restore the mill and the Peirce estate as closely as possible to their historic appearance. In 2012, FOPM planted the first trees in a re-creation of the Peirce Plantation apple orchard. In partnership with the park service, FOPM uses the orchard to teach schoolchildren about apple horticulture and history, and the nutritional benefits of fruit as well as whole grains. In the autumn of 2014 and spring-summer of 2015, Casey Trees volunteers and Peirce Mill interns planted more fruit trees and began the restoration of the wooded area on the slope behind the orchard. Over two dozen apple and pear trees (including several of the prized Albemarle Pippin apple variety) now grow on the hillside west of the mill, where an historic orchard once stood. Two dozen oaks, maples, pines and other native trees were also planted on space cleared of Multiflora Rose thickets and other invasive species. In May 2016, the barrel hoist, a mechanism that moved barrels and sacks of flour between floors during the mill’s commercial operation, was brought back into operation. Like other historic machinery inside the mill, the barrel hoist is powered entirely by the waterwheel. Additional mechanisms that await future restoration include the grain elevators, hopper boy, bolter, grain cleaner, and many chutes, gears, belts, and pulleys.